I've seen this several times in blogs but never in person, and while I have tried it once before, it was with miserable results. I still have a lot to learn, but I did my best, and I'm happy enough with it. I used petroleum jelly to coat my fingers, Zoya Remove+ to clean my nails, and then I forgot the base coat (oops) but I used China Glaze Emotion and China Glaze Cherish both from the Romantique Collection, and a top coat of Seche Vite. I think my thumb turned out the best but while I was cleaning it up, I scratched the polish on my nail. Go figure. I still have to do my right hand, and then wash my hands well to get all the PJ off, but here you go! oohhh, very cute!! :D Great job! 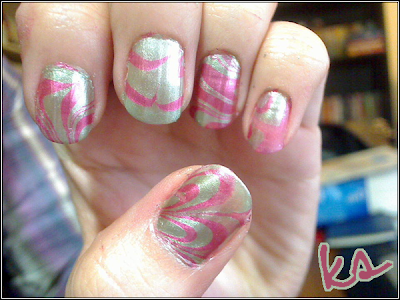 I still have yet to try out the water marbling.